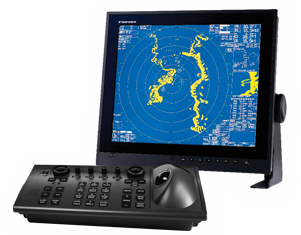 The radar incorporates a Video Plotter that displays electronic charts, plots own and other ship's tracks, enables entry of waypoints/routes and makes a radar map. The chart may be displayed in combination with radar images. 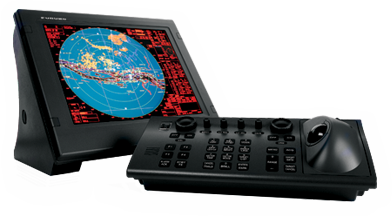 It is compatible with FURUNO or Navionics charts. Two automatic acquisition zones may be set in a sector in the shape desired. They also act as suppression zones, avoiding unnecessary overloading of the processor and clutter by disabling automatic acquisition and tracking outside of them. Targets in an automatic acquisition zone are shown with an inverse triangle. The operator can manually acquire important targets without any restrictions. Guard Zones generate visual and audible alarms when targets enter the operator-set zones. One of the Guard Zones may be used as an anchor watch to alert the operator when own ship or targets drift away from the preset zone. The target tracking symbol changes to a triangle when its predicted course (vector) violates the operator set CPA/TCPA. The operator can readily change the vector lengths to evaluate the target movement trend. An AIS-equipped ship may be shown on the display by both AIS and ARPA symbols. This happens because the AIS position is measured by a GPS navigator in L/L while the ARPA target blip and data are measured by range and bearing from own ship. When the symbols are within an operator-set criteria, the ARPA symbol is merged into the AIS symbol. The criteria is determined by the differences in range, bearing, course, speed, etc. A variety of navigational information which is vital for fishing vessels, including own ship status, radar plotting data, wind, water temperature and information from other shipborne sensors can be displayed in the data cells on the right hand side of the screen. The FAR2167DS radar has a unique zoom function which enlarges a part of the radar image twice or three times in size. The FAR2167DS is a high-performance S-band radar with 60 kW of output power. Detection and tracking of sea birds from a distance has always been very important for commercial fishermen. The noticeable advantage of the FAR2167DS is its capability to detect flocks of seabirds. S-band radar also assures target detection in adverse weather where an X-band is heavily affected by sea or rain clutter. The software and hardware are optimized for fishing operations, and they carry all the standard functions of the FAR-21x7 series. The radar incorporates state-of-the art signal/graphics processing technology together with auto tuning, logarithmic amplifiers and anti-clutter controls, for superb detection on all ranges. Thanks to its graphics processing technology, the echoes are expressively presented with 32 gradations in accordance with reflected echo strength. The anti-clutter controls suppress the unwanted echoes from waves, rain and clouds. The combination of these technologies ensures a clear image, even in rough seas. The FAR2167DS delivers a variety of useful functions to skippers. Direct Key control allows the operators to activate specific settings with just a few keystrokes. This feature is particularly important to one man fishing operations, where quick setup of the radar according to sea conditions is vital. The radar can be connected to an Ethernet network for a variety of user requirements. Up to four radar systems, both X- and S-band, can be networked without using an extra device. In addition, the essential navigational information including the electronic chart, L/L, COG, SOG, STW, etc. can be shared within the network.